October 16, 2014 by Ecommerce News. About Statistics with tags Croatia, Cyprus, Greece, Italy, Malta, Portugal, Spain, Turkey. 4049 views. With regards to the financial crisis, Southern Europe is still one of the most damaged regions in Europe. But maybe the ecommerce industry can change this, little by little. It’s estimated that online sales in this region will reach 47.8 billion euros at the end of this year, while this part of Europe also has shown an average annual growth rate of 22% since 2010. This is revealed by Ecommerce Europe’s report on the Southern Europe B2C ecommerce industry. It also announced that goods and services sold online in Southern Europe amounted to a total value of 40.8 billion euros in 2013, which corresponds to 11% of the total online sales in Europe. For this year, an increase to 47.8 billion euros is expected. There are more numbers about Southern Europe, which consists of Spain, Italy, Turkey, Greece, Portugal, Croatia, Cyprus and Malta. There are about 125 million active Internet users in this region and 48 million of them are buying goods or services online. The share of ecommerce is about 2% of the total retail industry in this part of Europe. When we look at the ecommerce sales per country, it’s clear Spain is the absolute champion. With total online sales of €14.4 billion it’s the leading country in Southern Europe, followed by Italy (€11.2 billion) and Turkey (€8.9 billion). Last year, the ecommerce industry in Southern Europe grew by 18.9%, which is a better performance than the European (+17.5%) average. But it’s not Spain or Italy that grew the most, it’s Turkey with a growth rate of 35%. This will not hold on forever as the Turkish growth is expected to further decline to 17.8% this year. According to Ecommerce Europe the expectation is that the Greek ecommerce industry will experience the strongest growth (+18.8%), just ahead of Italy (+18.2%). As always, Ecommerce Europe also looks at the average spending per online consumers in the regions it writes reports about. This time it seems the average Southern European online shopper spent 842 euros in 2013. This is less than the EU28 average of €1,500 or the European average of €1,376. It may be a surprise for some, but it were the Greeks who spent the most money online last year on average. Last year, the average Greek e-shopper spent €1,345 online, while shoppers from Cyprus (€1,000), Portugal (€954) and Spain (€874) follow. 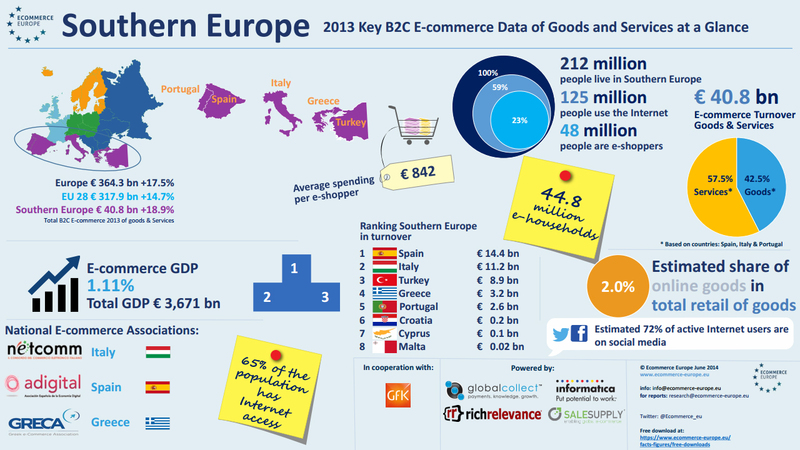 You can download a free light version of the Southern Europe B2C E-commerce report here.